Congratulations to all our club members on another successful term, we once again achieved President’s Distinguished Club for the 7th Year in a row. Thank you to all our outgoing officers who worked tirelessly throughout the term motivating club members and driving our memorable 2015-16 club program. President – Phuc-An Tran (CC, CL), VP Education – Karsten Brach (CC) / Tobias Häuser (ACB), VP Membership – Alexander Theile, VP Public Relations – Hiram Ergetu, Secretary – Ying Meng, Treasurer – Peter Bird (ACB, CL), Sergeant at Arms – Marc Schuck (CC), Camera Operator – Claudia Dittrich, and Immediate Past President – Guenter Schmid (DTM). President’s Distinguished Club is the highest level of recognition available to clubs. Toastmasters International rates clubs all around the world on how well they encourage members to pursue their communication and leaders goals. We look forward to another exciting program in the 2016-17 term with a new highly motivated officers team, who were unanimously voted in by club members on Monday, 6 June 2016. President – Karsten Brach (CC) , VP Education – Peter Bird (ACB, CL), VP Membership – Marc Schuck (CC) / Ying Meng, VP Public Relations – Matthew Setter / Hiram Ergetu, Secretary – Elisabeth Schwille, Treasurer – Alexander Theile, Sergeant at Arms – Chet Sanders / Ilias Anwari, Camera Operator – Claudia Dittrich, and Immediate Past President – Phuc-An Tran (CC, CL). Thank you once again to our outgoing officers, and welcome to our new 2016-17 club officers! Pictured below are some of our incoming officers for 2016-17 (l-r) Immediate Past President – Phuc-An Tran (CC, CL), VP Public Relations – Hiram Ergetu, Camera Operator – Claudia Dittrich, Treasurer – Alexander Theile, VP Membership – Marc Schuck (CC), VP Education – Peter Bird (ACB, CL), Club President – Karsten Brach (CC), Sergeant at Arms – Chet Sanders, Secretary – Elisabeth Schwille, and Sergeant at Arms – Ilias Anwari. 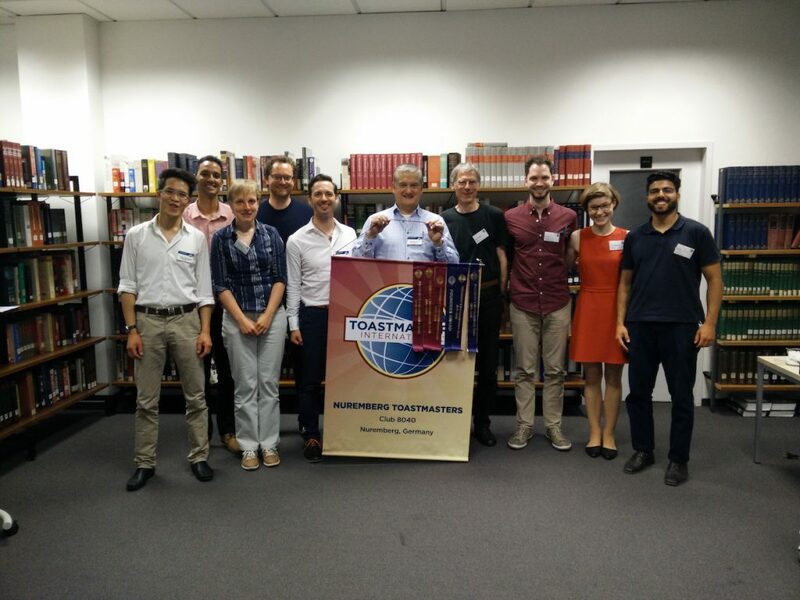 If you would like to know more about Toastmasters International or Nuremberg Toastmasters, and you would like to visit our club as a guest, please send an email to our VP Membership – Alexander Theile. Come along either the 1st or 3rd Monday of each month.